In our fast-paced world, deadlines have become the norm. We’re constantly chasing the next big event, market trend, or technological advancement. So, you’d think technology companies and web developers would be getting better at meeting deadlines. You’d be wrong. Did you know, a meager 39% of all projects are reported to be successful? A study performed by the Standish Group showed that only 39% of projects reviewed around the world were successful (delivered on time, on budget, with required features and functions). That’s a scary statistic! Now, I realize that 100% success is not realistic. In fact, some projects will never be completed on time and on budget. That’s because we’re dealing with human beings. A client decides they want a blue square website with three circles. But, three months later, they really wanted a red circle website with four squares. We’ve all been there. So, how do we overcome some of these obstacles at DevSavvy? The most important first goal of a project is to set clear, concise expectations. I’m a big fan of asking questions at the start. In fact, I like the uncomfortable questions. If I can make the team think about the potential issues with the project requirements, I’m doing my job. I recently worked on a website redesign. The client gave us a two-week deadline. I asked why. You can imagine their response. “Why two weeks?” I added. After a minute of silence, I elaborated. “Would you like time to review our work? If so, how many days will you need to review each of the 60 pages we’re building?” The client started to understand the question. See, most web developers take on unrealistic deadlines to begin with. They allow the client to setup a lose-lose scenario. Clarity and perspective give projects the best chance for success. 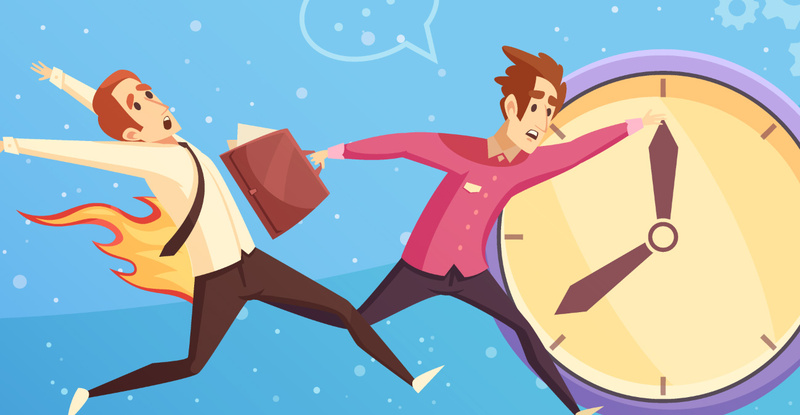 Many projects will miss deadlines because the team is not efficient or competent. Unfortunately, there are many web programmers out there. And, a lot of them write messy code. If you think about writing a paper. A well written paper with 200 words is far better than a messy ensemble of adjectives 1000 words deep. The same is true with code. I’ve “inherited” oodles of websites that could have been written better and faster with fewer lines of code. This one is not new to you. Yet, most web companies fail to manage this, the most important variable in meeting deadlines. FACT: When the scope of a project changes, the percentage of missed deadlines will increase. They are directly proportionate. It’s imperative that your web team communicates that a task or request is out of scope. I recently had a client provide a new PSD for a landing page 90% into the project. The new PSD featured a completely new set of font styles, colors, and positioning of page elements. We were on track to meet our deadline. And, we were under budget! I couldn’t do much about the new PSD. But, before I closed the file, I sent an email to the client to explain what this new PSD would mean for the project. I communicated that the deadline would be missed by about a week. I added that the scope had increased and we would need an additional set of hours to complete the new layout build. The result? The client was happy. That’s my point. We’re not always going to be able to meet deadlines. After all, our clients are people. They make assumptions. They make decisions. They have opinions. But, with the right practices in place, we can meet deadlines far more often or at least help the client understand their original deadline wasn’t realistic in the first place.